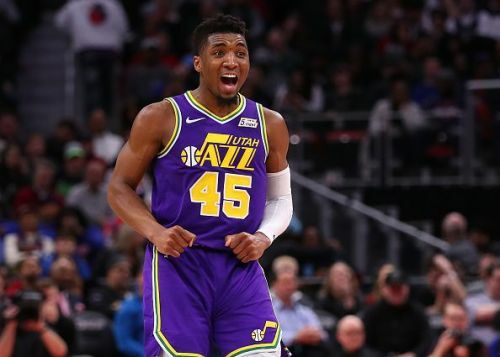 NBA's reigning Dunk champion Donovan Mitchell, will not defend his Slam Dunk Contest title at the All-Star weekend in Charlotte next month. The 22-year Utah Jazz guard won last year's Slam Dunk Contest in a tough contested dunk-off against Victor Oladipo, Dennis Smith Jr. and the other finalist Larry Nance Jr.
A dunk contest definitely asks a lot from a player, in terms of focus, preparation and hardwork that goes in every single slam dunk that is to be orchestrated and performed. Donovan Mitchell is focused on the second phase of the season and won't take chances in making the push to clinch a hefty playoff spot. “It really stems from when I got hurt, the three different times I got hurt this year. I remember last year when I came back from All-Star, I was tired,” Mitchell said. "I loved doing the dunk contest last year and it was a ton of fun, but I also know it takes a lot of focus, practice and preparation. Right now, my mind is really on helping my team make a deep run [in the] second half of the season. I’m excited though for the weekend, I’m going to be able to be a part of some great events." Mitchell, seeking a spot for his All-Star game debut, fell outside the top ten of the voted Western Conference guards after the third round of fan voting, while his ROTY competitors- Ben Simmons, Jayson Tatum and Lonzo Ball have all made it to the list. He will be eligible to play Rising Stars Challenge, which is the tip-off event for the weekend. Though he is not participating in the Dunk contest this year, he says he will be eager to do it again in the future. This season, Mitchell is averaging a good 21.7 points per game at 42.5% shooting. He has not been that prolific as he was during his rookie campaign but is indeed Jazz's principal force. He is letting the game come to him, making his teammates play and is standing up to the occasion when needed. Jazz now sits at the 8th position with a 26-22 record and would require Mitchell to take charge and move them further up in the Wild West.